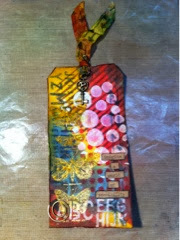 I finally got a Tim Holtz tag done, yay!, in the month Tim featured his tag :). 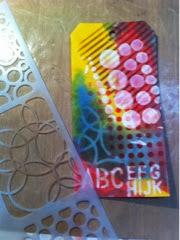 I have a love affair with stencils right now and Tim's new stencils make me drool, but I haven't gotten ahold of any yet. I used Dylusions stencils and Crafters Workshop stencils on this project, and followed along with Tim's wonderful instructions on his website. 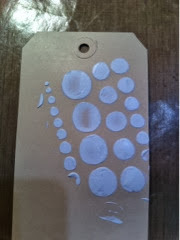 I used Gesso through a circle stencil, using just part of the stencil. 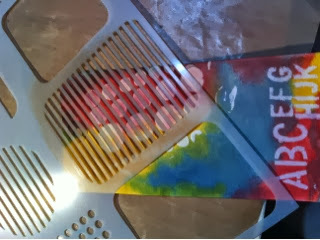 I then dried it with my heat tool. 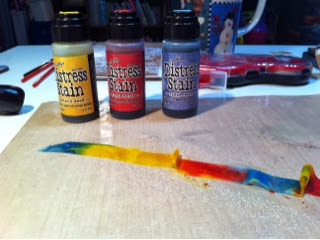 I then used the Snow Cap paint dauber through the alphabet stencil, drying my tag, and then adding my 3 colours of Distress Stain. I sponged brown Distress Ink over a lined stencil on top of the Gesso. 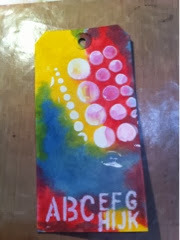 I then sponged on a few more stencils in different areas of the tag. 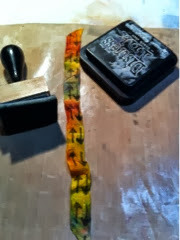 I used the same colours of stain to colour my crinkle ribbon. I then sponged an arrow stencil over my ribbon. I used the shiny brass Distress Stain to ink up the Tim Holtz butterfly stamp and stamped on the left side of the tag (notice the alphabet stencil on the left and the arrow stencil on the right). I also used an edge distressing tool around the sides. I added words from the Tim Holtz Chatter sticker book on the bottom right- edged in black, the gold circle on the bottom left and the key hung from a safety pin on the ribbon. It was so fun making this tag! This was like taking a little mini class from Tim and gets you using those supplies you might not normally use together. Speaking of classes, I am really looking forward to Tim's Creative Chemistry class on Online Card Classes coming up in October. Here's to getting inky! Very creative version of Tim's tag!